Why Is Play So Important For Preschool Children? Why Is Play So Important at Preschool? Academic standards are rising. More is expected of children in school than ever before. Parents don’t just worry about getting their young preschool children ready for kindergarten, but their entire academic future! If a child isn’t able to quickly learn their ABCs and 123’s, will her or she be able to do division in elementary school? What will happen when it comes time to take college entrance exams? It’s not hard to make those frightening leaps when it comes to your children. It’s only natural you want the best for them, and you want them to perform at their highest potential level. And as the pressure to achieve increases, some parents (and even teachers) believe the answer is to meet that pressure with a preschool curriculum filled with harder work, longer times behind a desk, and even stricter consequences for children acting like children. This is actually the exact opposite of what children really need. In a preschool classroom, children need play time and plenty of it. Play offer more benefits than can be counted here, but here are a few of the more important benefits that play offers preschool children. Worksheets are not the only (or even ideal) way for kids to develop their language. In play, children must rely on their words to explain themselves and achieve the outcome they’re hoping for. They must improvise on the spot and use language to problem solve. Talking to other children as they play helps them to develop new vocabulary as they set rules for their play, talk about what they’re doing, and step into imaginary roles. 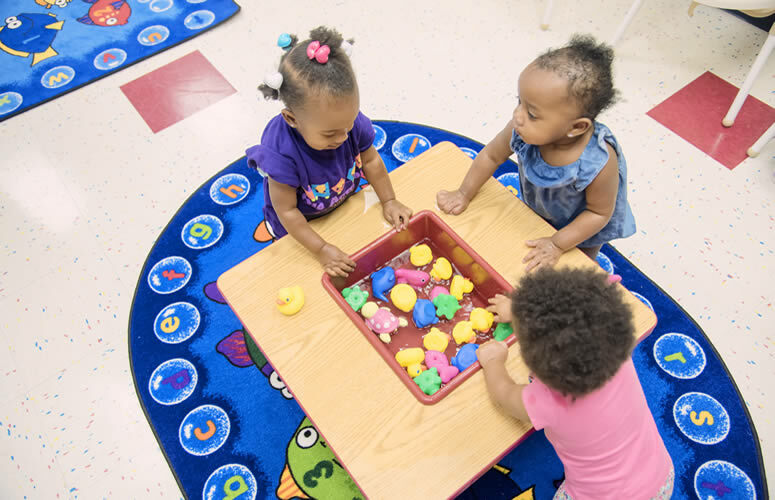 A good teacher creates preschool curriculum that includes play situations where children will have opportunities to develop their language together. You may think play does nothing for reading skills, but it actually enriches and enhances your child’s ability to read. Storytelling teaches children pre-reading skills, like following a plot, rhyming, and sentence structure. Children then naturally take storytelling into their playtime, which prepares their mind for reading down the road. It’s not surprising that play helps to develop social skills in preschoolers. Children learn to take turns, cooperate, build on each other’s ideas, and express frustration in healthy ways. A good preschool teacher helps children find the right words to handle conflicts and provides children with the skills they need to maneuver through rough social situations. The ability of a child to access their creative side is a huge asset for all walks of life. Having time to play in a preschool classroom gives your child the chance to come up with new worlds, new creatures, new scenarios, and more. This also ensures your child knows how to entertain him or herself. The ability to avoid boredom is one skill many children are losing. Creative play gives your child an advantage in this area. Think how valuable this skill will be not only for a child’s academic future, but for his or her entire life. Dramatic play, free play, crafting, and more all allow your child to develop creativity, gaining confidence in what his or her mind can come up with! When we consider school and academics, we often forget to think about our children’s physical development, but this is a big mistake. Physical health is essential to proper academic performance, well-being, and happiness. When play is allowed at preschool, children develop both gross and fine motor abilities. In a safe, playful environment, children will push their bodies to do new things, developing gross motor skills along the way. When children use fine motor skills while crafting or playing with small objects, their fingers and hands develop the skills and muscles they’ll need to write. Children with well-placed confidence can achieve whatever they set their minds to. Play helps to develop strong self-confidence in children as they try and try again to master different activities. Building with blocks is so fun that a child will continue to create a tower even after it has fallen over multiple times. As a child fails, but tries again, a child will learn that he or she can improve and succeed. For a preschooler, play is so much more than play. It’s how a child learns to understand the world. It’s how he or she interacts with difficult situations. When play is properly incorporated into preschool curriculum, your child will grow, develop, and thrive.